Fish without a license Saturday and Sunday, but keep rules and regulations in mind. Feb. 17, 11 a.m. to 4 p.m.
Join this event that features thousands of door and raffle prizes and lots of indoor kids activities. This event is hosted by the Caseville Chamber of Commerce and rewards anglers who catch the biggest walleye, lake trout, yellow perch and northern pike. Held at Central Park South, this annual event is hosted by Meridian Township Parks and Recreation. 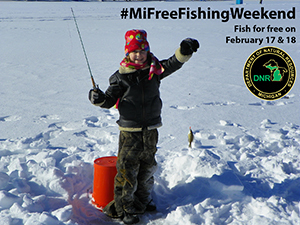 Join the Macomb Sportsmen Society for this event, where kids get a free ice-fishing lesson! Equipment, shelter, bait and lunch will be provided. Feb. 17, 9 a.m. to 2 p.m.
Head to Seven Lakes State Park for an annual event that’s fun for the whole family. Loaner equipment will be provided, as well as refreshments, prizes and a warm fire. Feb. 17, 10 a.m. to 3 p.m. Check out Wolf Lake State Fish Hatchery's annual Free Fishing Weekend event. Lots of activities are planned for the Mattawan site, including hatchery tours, snowshoe rentals, a winter scavenger hunt, ice-fishing seminars and jig making. All events are subject to weather conditions. The DNR Recreation Passport is not required for entry to state parks and recreation areas. There are many other events scheduled in locations throughout the state. Information about these events, including those listed above, can be found at michigan.gov/freefishing. 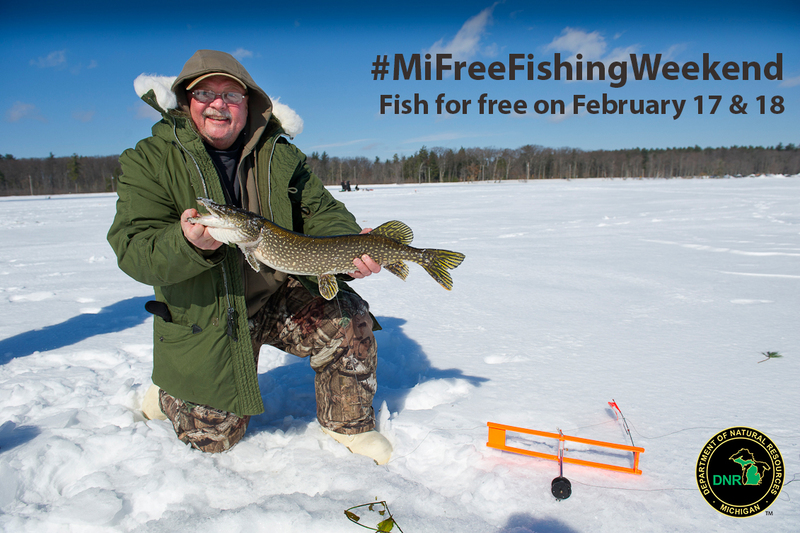 Michigan has been celebrating the Winter Free Fishing Weekend annually since 1994. With more than 3,000 miles of Great Lakes shoreline, tens of thousands of miles of rivers and streams, and 11,000 inland lakes, Michigan and fishing are a natural match. /Editors’ note: Accompanying photos and information are available below for download. Suggested captions follow. 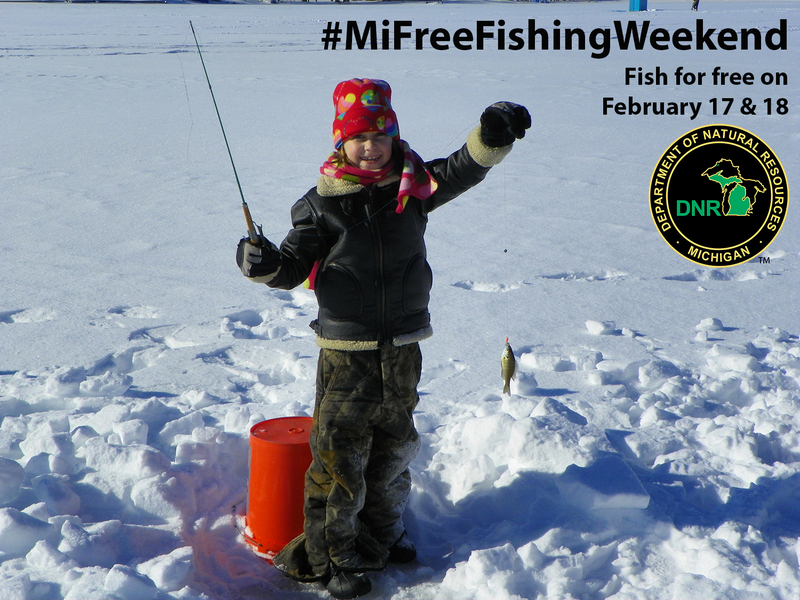 2018WinterFFW-promo3.jpg: Michigan's annual Winter Free Fishing Weekend is a great time to introduce a young person to ice fishing. 2018WinterFFW-promo2.jpg: Informal shanty towns often pop up on frozen inland lakes throughout Michigan during the winter. 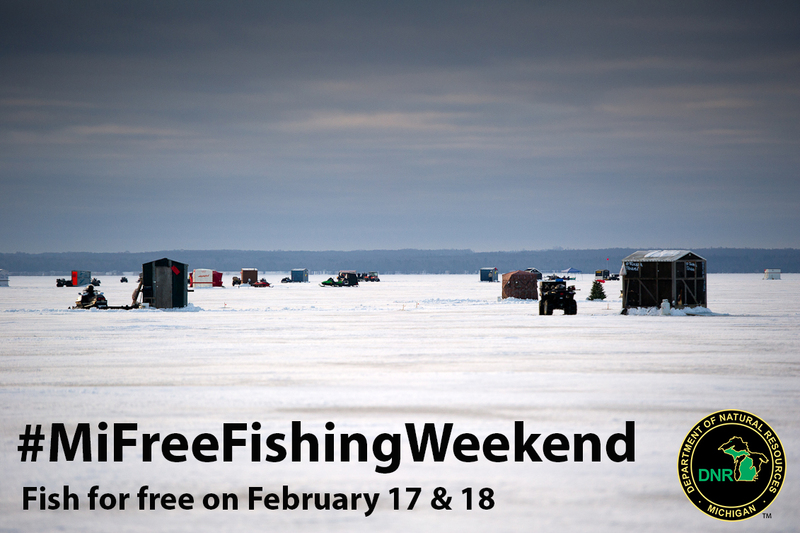 See if there's one in your area during the 2018 Winter Free Fishing Weekend. 2018WinterFFW-promo1.jpg: Try a new technique or target a new species during this winter's Free Fishing Weekend.